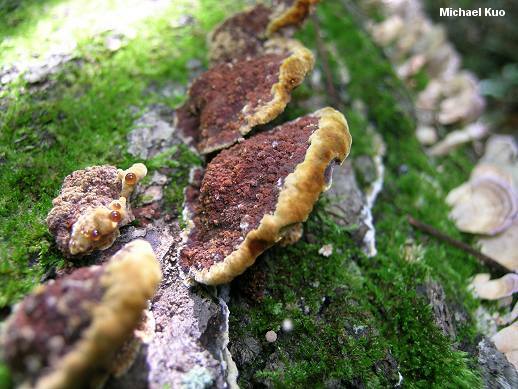 Widespread and common in North America's hardwood forests, Phellinus gilvus is easiest to recognize when it's growing, since the marginal area of growth is often mustard yellow in this stage, contrasting nicely with the reddish brown cap. Phaeolus schweinitzii can develop a similar yellow margin, but it grows on conifer stumps and is usually larger. 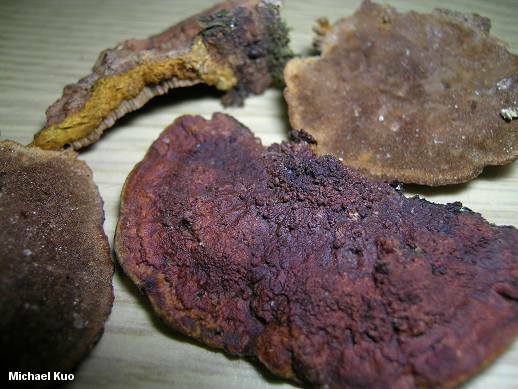 Other important identification features for Phellinus gilvus include the yellowish brown to orange-brown flesh, the purplish brown pore surface composed of very tiny pores, and the red-then-black (or just black) reaction of its surfaces to KOH. Ecology: Saprobic on the dead wood of hardwoods (especially oaks), causing a white rot of the sapwood; also apparently occasionally parasitic on the heartwood of living hardwoods; growing alone or in overlapping clusters; usually annual but occasionally perennial; found year-round, especially in warmer climates, but usually appearing in late spring, summer and fall; widely distributed in North America but absent or rare in the Rocky Mountains. 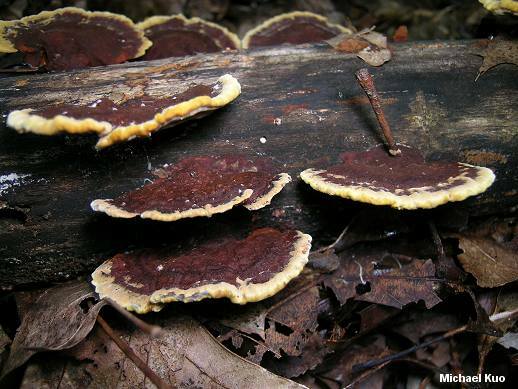 Cap: Up to 15 cm across; more or less semicircular, irregularly bracket-shaped, or kidney-shaped; flattened-convex; rugged; sometimes somewhat velvety; the margin when growing velvety and mustard yellow to yellowish; elsewhere dark reddish brown or dark yellowish brown (eventually blackish). Pore Surface: Dark purplish brown to brown or reddish brown; pores minute (6-8 per mm); tubes 1-5 mm deep (for each layer, in perennial specimens). Flesh: Bright yellowish brown to orange-brown; tough. Chemical Reactions: KOH red, then black (or merely black) on all surfaces. Microscopic Features: Spores 4-5 x 3-3.5 µ; smooth; elliptical. Setae abundant; thick-walled; dark brown in KOH. Hyphal system dimitic. REFERENCES: (Schweinitz, 1822) Patouillard, 1900. (Fries, 1828; Overholts, 1953; Arora, 1986; Gilbertson & Ryvarden, 1987; Lincoff, 1992; Roody, 2003; Binion et al., 2008.) Herb. Kuo 07290401, 07310401, 09210502, 04290603, 06090702.